Zoom is the webinar tool that will be used for the webinars that have been scheduled for your online graduate subjects. This guide includes information and instructions to ensure you are familiar with Zoom to participate in these webinars. All scheduled webinars are run via Zoom. To access scheduled Zoom webinars please click the Zoom link on the left hand menu of the main LMS subject page. If you have not used Zoom before you will be prompted to install it (see instructions below). During the scheduled webinars, a Webinar Technical Support Officer will be available to provide technical support and to help resolve any technical difficulties students may experience. Please note that this assistance is only available during the scheduled webinar sessions to manage any in-webinar issues. If you have any Zoom webinar tools issues you should refer to the resources provided at the end of this guide. Click the URL link for your webinar. If you are a first time user, you will be prompted to download and install the launcher. 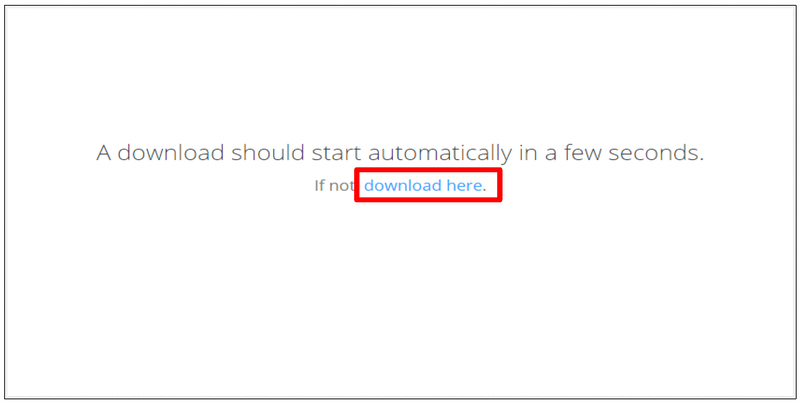 The download should begin automatically. If not, click the download link that is available on your screen. The download should take no more than a few minutes; however, you are encouraged to install Zoom at your earliest convenience ahead of the first webinar in which you are due to participate. In the Open File-Security Warning dialog box, click Run. This will initiate the Zoom Installer which will install the application settings. Next, in the Zoom dialog box, enter your name, and then click Join. NOTE: You should regularly check that you have the most up-to-date version of Zoom installed on your computer. You can update your version of Zoom by accessing the University of Melbourne's Zoom Download Centre. It is important that you do this as some of the annotation tools may not appear on your screen if you do not have the most recent version of Zoom installed. 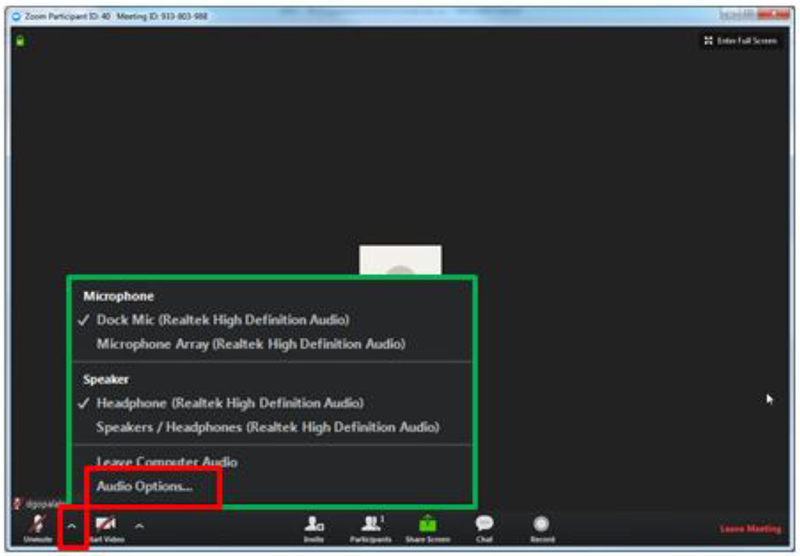 If you are a first time user you will receive a pop-up that allows you to test and set up your audio preferences or join the webinar by using your computer’s audio by default. It is recommended that you first set up your audio and video options. Please note that your audio and video preferences are saved for future webinar purposes, so you don’t need to set up every time. In the pop-up box, click Test Computer Audio. This displays the Audio options within the Settings dialog box. It is recommended that you use a headset (a headphone with an attached microphone). This will help reduce background noise and ensure good audio quality when you speak. When you join a meeting, Zoom automatically identifies the speaker you are using – in-built speakers, a headphone or an attached speaker. Similarly, it identifies the microphone you are using, i.e. a doc mic, a jack mic, or your computer’s integrated microphone (microphone array). In the Settings dialog box, on the Test Computer Audio page, click Test Speaker. Check you can hear the test sound and the volume of the sound is at a desired level. Move the slider to increase or decrease the volume. If you can’t hear the audio, select a different speaker from the list and test again. Next, click Test Mic and speak into your microphone. Your voice will be recorded. You will notice that when you click Test Mic, the option changes to Recording. Click Recording. This will play your recorded voice. Confirm that you can hear your voice and it is clear. Use the slider to set the volume for your microphone. 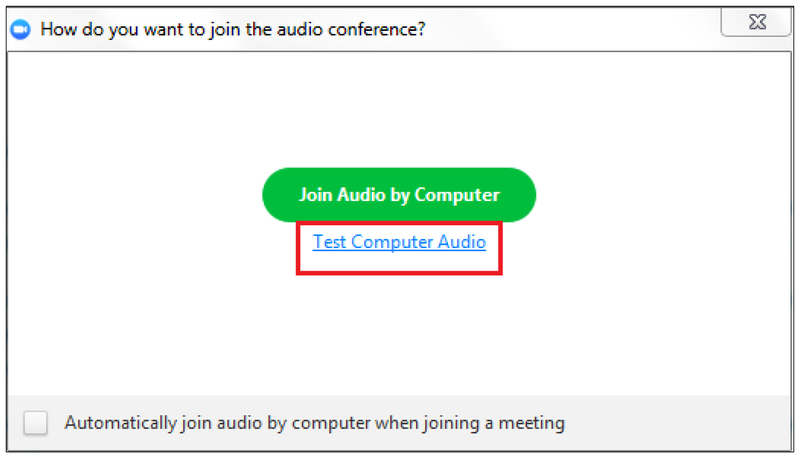 You will notice that the options to automatically join audio by computer and mute microphone when joining a meeting are selected by default. It is recommended that you keep these settings as is. 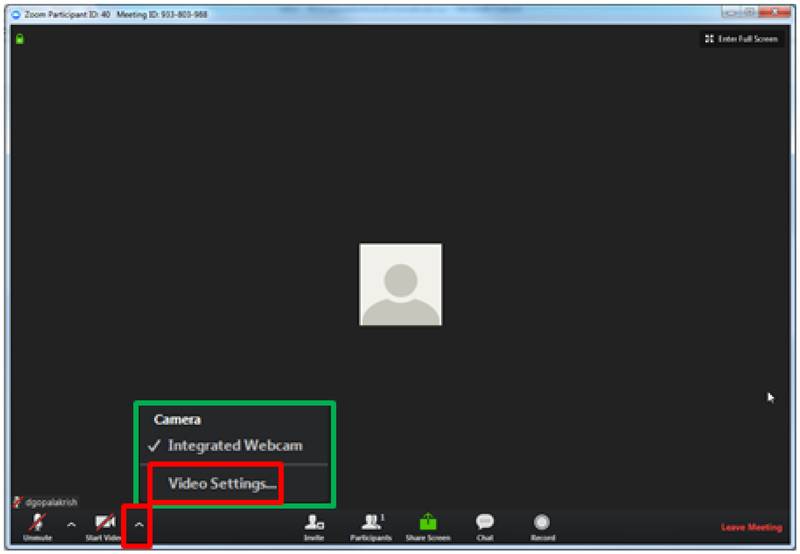 Next, if you are using an external webcam or a laptop with an integrated webcam, set up your video options. In the Settings dialog box, on the left menu, click Video. You should be able to see yourself in the window. If not, confirm that the correct webcam is selected. Click the down arrow for Camera and then, from the list, select your webcam. If the correct webcam is selected for the Camera option, and you are still unable to view your image, click trouble shooting and follow the suggestions available. You can set up the remaining options as desired. You can enable or disable the mirror effect for your video. The mirror effect is useful when you are presenting, this will ensure that your webcam image is not reversed like it normally is when you take a selfie. You can see your right side on the right and your left side on the left which makes it comfortable when you use hand gestures to present or explain a concept. You can choose to turn your video on or off when you join meetings, hide participants that are not using a video, have a spotlight when you speak, or use a 720 p video quality. Finally, close the Settings dialog box. Click the cross sign in the top-right corner of the Settings dialog box to do so. Chrome users: In the External Protocol Request pop-up box, select the option Remember my choice for all links of this type and then click Launch Application. 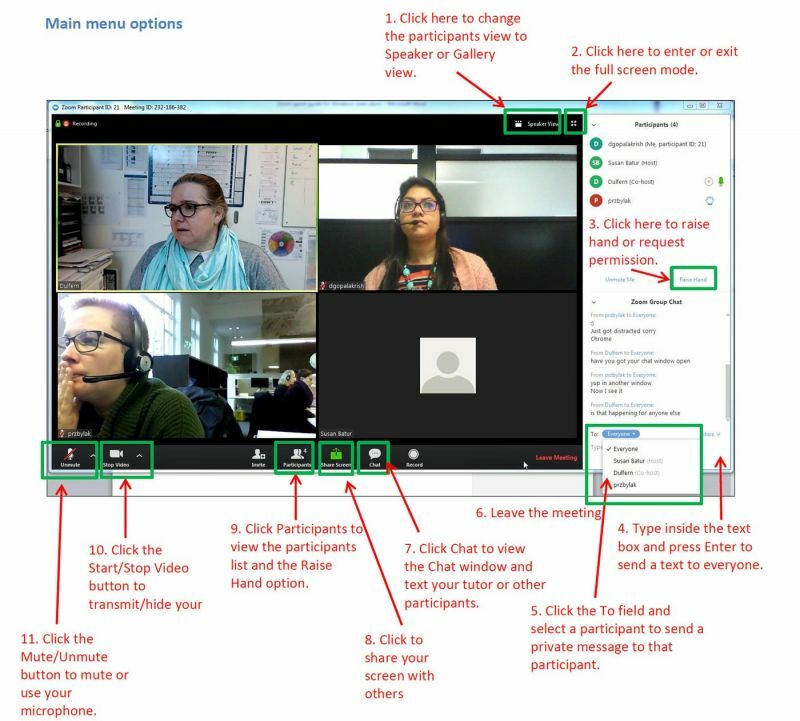 Next time, you use the Zoom webinar link to join a webinar, Zoom will automatically launch and you will be connected to your webinar room. Internet Explorer users: You will automatically be connected to your webinar room. Firefox users: In the Launch Application pop-up box, click OK. You will be connected to your webinar room. The audio and video preferences that you set up the first time are saved for your future webinar purposes. So, you don’t need to set up every time. However, you can easily change the settings any time you wish to do so. To access your video settings, on the menu at the bottom of your Zoom window, click the up arrow to the right of the Start/Stop Video button, and then click Video Settings. To access your audio settings, click the up arrow to the right of the Mute/Unmute button, and then click Audio Options. Next, in the pop-up box, click Test Computer Audio. Mute/unmute your microphone and access audio settings. When you enter your webinar room, you will be able to see other participants who have joined the webinar. You will see videos for participants who have enabled their videos and blank windows for participants who have disabled their videos. The default view of the room is Gallery view in which you can view all participant windows including yours in the webinar room. As more participants join, you will notice the participant windows re-size to fit into the room area. The Gallery view provides the opportunity for a group learning experience and helps you feel connected. In a Gallery view, the speaker’s window is highlighted in green. 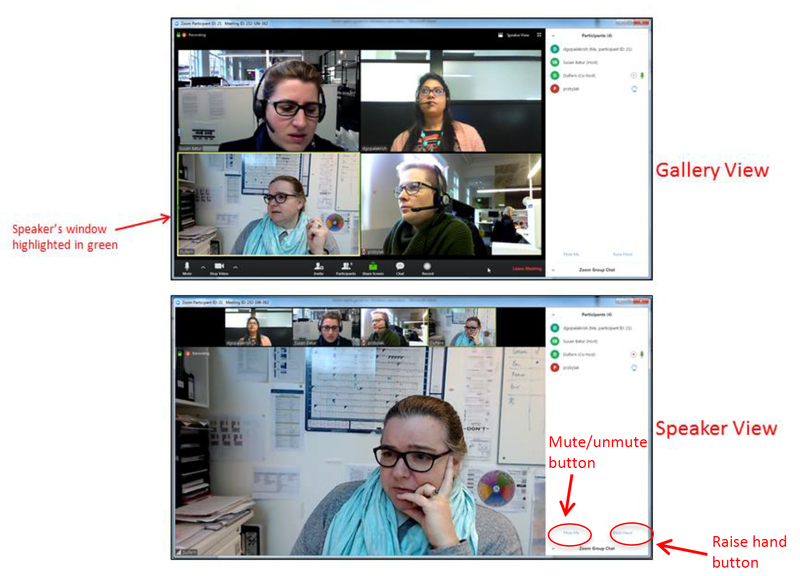 In the Speaker view, the speaker’s window appears expanded at the bottom of the webinar room and the participant windows appear at the top in a horizontal row. You can toggle between the Speaker and Gallery views by using the option in the top right corner of your webinar room. On the menu at the bottom, click Participants. This displays the Participants panel to the right of your Zoom main room. Next, inside the Participants panel, in the bottom-right corner, click Raise Hand. Note: The Participants panel also includes the Mute Me/Unmute Me option in the bottom-left corner if you need to use your microphone and speak at any time during the webinar. On the menu at the bottom, click Chat. This displays the Zoom Group Chat panel to the right of your Zoom main room. If your Participants panel is open, you will be able to view the chat panel at the bottom of the Participants panel as in the image above. To use the group chat feature, i.e. send a text message to all participants (including your tutor), type your message in the text box at the bottom of the chat panel and press Enter. To send a private message to your tutor or another participant, in the To field, click the down arrow, and then from the drop down list, click the name of your tutor or the participant you want to text. To open and view the chat panel in a separate window, click the down arrow in the top-left corner of the chat panel, and then from the menu, click Pop Out. You can use the Share Screen option to share your presentation slides, your desktop (computer screen), or the whiteboard. On the menu at the bottom, click the green Share Screen button. This will display a pop-up that prompts you to select a window or application to share. The pop-up by default includes your desktop (computer screen), whiteboard and all other files that are open on your computer. Click to select a file or application you want to share, and then at the bottom right corner of the pop-up, click Share Screen. When you share a file or application with other participants, your screen fills the webinar room area and the participant windows are re-positioned vertically to the right side of the room area. You can move the participant windows to any side of your webinar room or computer screen by dragging them. Let’s consider an example where you share your whiteboard to brainstorm or discuss on a topic. 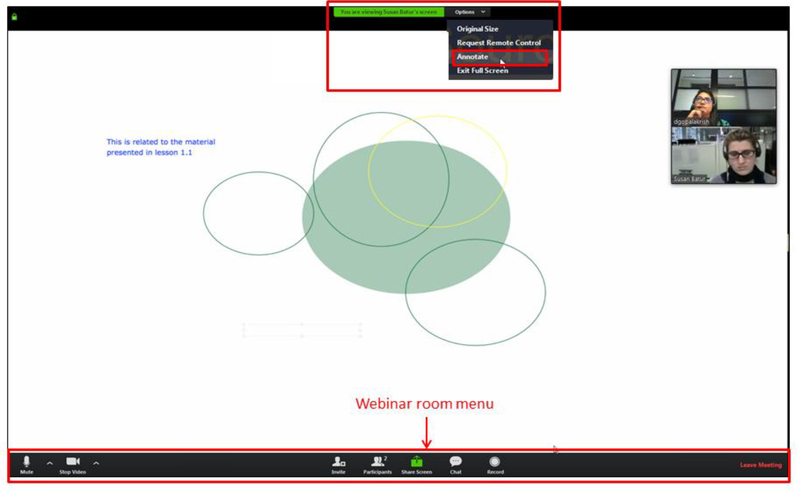 On the menu at the bottom of your webinar room, click the green Share Screen button. In the pop-up window that appears, click Whiteboard, and then click Share Screen. You will notice that when you select a window or application to share, the selected window/application is highlighted in green. Your whiteboard tools appear on a new menu at the top and your webinar room menu at the bottom now includes additional options to pause/stop screen share, use or hide whiteboard tools and share a new screen if desired. You can drag to re-position the menus anywhere on your screen. The freehand draw tool (the first option under Draw) is selected by default. On the whiteboard tools menu, click Select to use your mouse and unselect the freehand draw tool. Note: In this example, we used a whiteboard to demonstrate the Share Screen option. 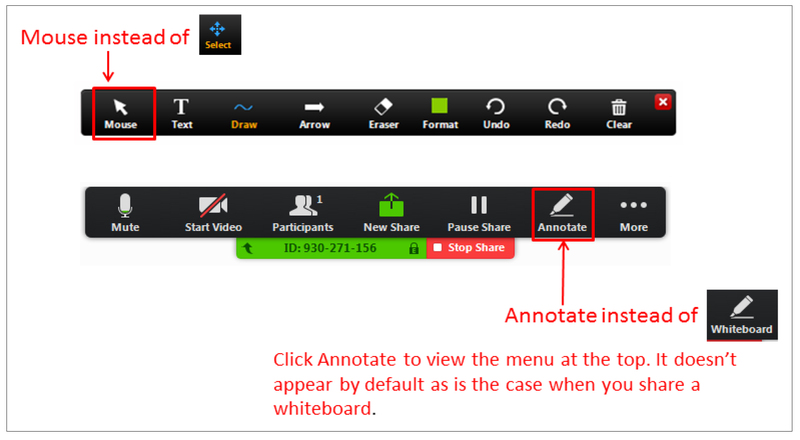 If you were to share a PowerPoint or another application, you will see the Annotate option in place of Whiteboard, and the Mouse option in place of Select as shown below. Also, you will need to click Annotate to be able to view the Annotate tools menu. To unselect a whiteboard/annotate tool and use your mouse at any point during screen sharing, on the menu, click Select/Mouse. To type text on your shared screen, on the menu, click Text, and then click an area on your screen where you want to include the text. A text box appears in that area. Next, type your text inside the text box. To draw a shape or highlight an area on the screen, point to Draw, and then from the drop-down, click a shape that you want to use. Next, click the area where you want to draw the shape or highlight and drag (your mouse) until the shape is of a desired size or highlights the desired area. To use the check or cross sign, on the menu, point to Draw, from the drop-down, select the check or cross sign, and then click the area on the screen where you want to place the check or cross sign. You could use the check and cross signs for polling purposes or to present a checklist or list of dos and don’ts when presenting. To point to a text, object or area of interest, use the Arrow/Spotlight option. On the menu, click and select the Arrow/Spotlight option as desired. Spotlight resembles the light from a pen pointer or a laser pointer. When you use the Arrow option, the arrow appears with your name on it. To format your text or shape, on the menu, point to Format, and then from the drop-down, select the format options you want to use. The format options allow you to change the colour, border and width of a shape. In addition, the Font options within Format allow you to bold, italicise, or change the font size of your text. Use the Clear options to clear the annotations on your screen. Use Undo to remove your annotations one by one starting with the most recent one. Click Save to save your shared screen/whiteboard. Use the Show in Folder option within the saved message pop-up to identify your computer location where the shared screen/whiteboard is saved. The whiteboard is saved to the Documents Library on your computer by default. Within the Documents Library, you will find a folder for Zoom. Open the Zoom folder to access your saved whiteboard. 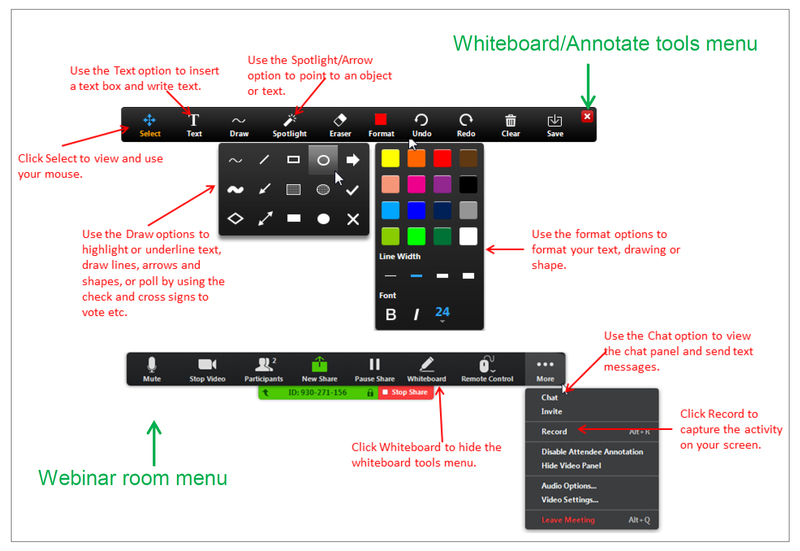 To hide the whiteboard/annotate tools, on the menu, click Whiteboard/Annotate. To access your chat window and send text messages, on the menu, click More, and then from the drop down list, select Chat. The Zoom Group Chat window appears at the centre of your screen. Drag the chat window to re-position it at a desired location on your screen. To record the activity on your screen, on the menu, click More, and then in the drop-down list, click Record. This will record your screen including the audio. To pause/stop recording, click Menu, and then in the drop-down list, click Pause Recording or Stop Recording. Note: Your recording will automatically be saved and converted to a viewable format after you leave the webinar. 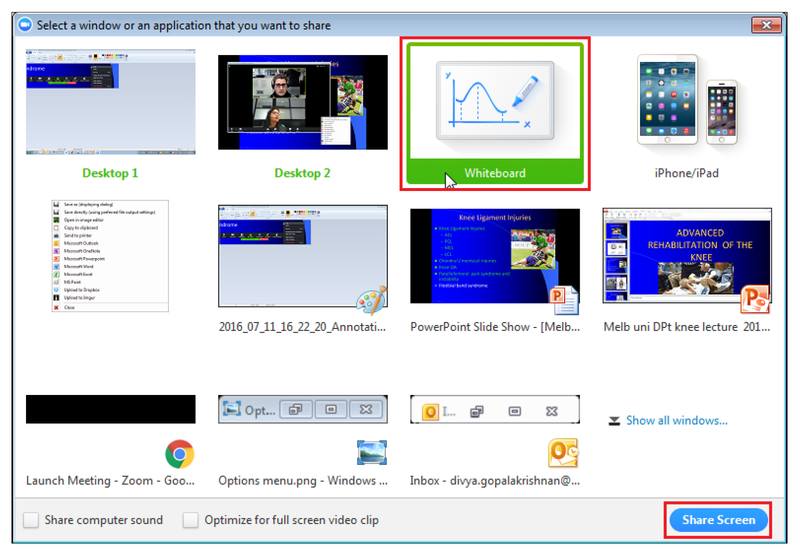 To stop sharing your whiteboard, PowerPoint, or application, on the menu, click Stop Share. When your tutor or a participant shares a file or application, you will notice that the file or application being shared fills the webinar room area and the participant windows are arranged vertically to the right side of the room. You can drag the participant windows to re-position them anywhere within the webinar room or your computer screen. You will also notice a green text box at the top of the webinar room that says you are viewing a shared screen and an Options menu to the right of the green text box. To access your annotate tools, click Options and then from the drop-down menu, click Annotate as shown below. Use the annotate tools as detailed above. Note: Unlike when sharing a screen, the webinar room menu at the bottom does not change. You can use the webinar room menu to mute/unmute your microphone, start/stop your video, view participants list, send text messages through chat, record the webinar, or leave the webinar. Breakout rooms provide the opportunity for webinar participants to work in groups. Your webinar sessions may include activities that you will be required to complete as a group within the breakout rooms. These could include brainstorming exercises, discussions, presentations and more. Breakout rooms have full audio, video and screen share capabilities. Your tutor will create the breakout rooms for you and assign you to a breakout room. All instructions for the breakout room activity will be provided to you upfront. Let’s now look at instructions that will help you join breakout rooms, invite your tutor to your room and make a request for assistance, and leave the breakout room to join the webinar main room. When you tutor assigns you to a breakout room, you will receive a pop-up message on your screen that says The host is inviting you to join Breakout Rooms. In the Breakout Rooms pop-up box, click Join. Your breakout room interface is very similar to the webinar main room. The menu at the bottom includes additional options that allow you to invite and request your tutor for help and leave the breakout room. Use the Share Screen, Chat, Mute/Unmute and Start/Stop video options as detailed in the Use the options in your Zoom interface section in this document. To invite your tutor to your room, on the menu at the bottom of the screen, click Ask for Help. You will receive a pop-up message on your screen. In the Ask for Help pop-up box, click Invite Host. This will notify your tutor and your tutor will join your room. To leave the breakout room, in the right corner of the menu, click Leave Breakout Room. You will receive a pop-up message on your screen. In the Breakout Rooms pop-up box, click Return to Main Session. A full list of user guides can be found on the Zoom support site. Your dedicated Online Student Support Team can help with all your administrative questions.